The Prime Minister, Shri Narendra Modi inaugurates the various plants of Gujarat Narmada Fertilizers Corporation Ltd., at Bharuch, in Gujarat on October 08, 2017. The Chief Minister of Gujarat, Shri Vijay Rupani, the Deputy Chief Minister of Gujarat, Shri Nitinbhai Patel and other dignitaries are also seen. The Prime Minister, Shri Narendra Modi, today unveiled a plaque to mark the laying of Foundation Stone of Bhadbhut Barrage over the River Narmada. At a public meeting in Bharuch, the Prime Minister also flagged off the Antyodaya Express between Udhna (Surat, Gujarat) and Jaynagar (Bihar). 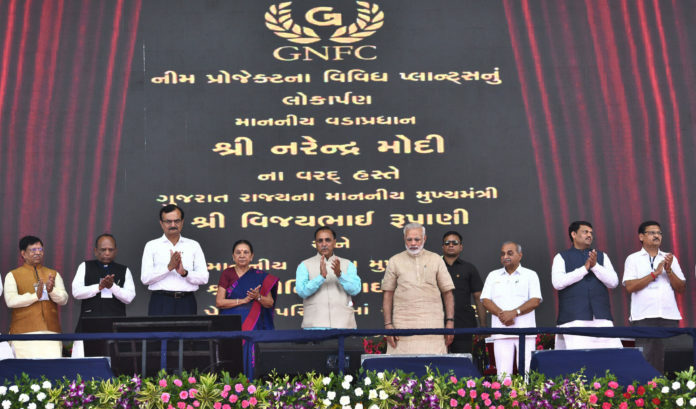 He also unveiled a plaque to mark the laying of Foundation Stone, and Inauguration of various plants of Gujarat Narmada Fertilizer Corporation Ltd. Addressing the public meeting, the Prime Minister said that the Antyodaya Express is a commendable initiative, which connects people and particularly helps those who are from Uttar Pradesh or Bihar, and work far from their home. He said the train will make it easier for people from Uttar Pradesh and Bihar to go home for Chhath Puja. Neem coating of urea helped farmers and stopped corruption as well as theft, the Prime Minister said. Shri Narendra Modi said that Gujarat’s strides in animal husbandry have helped farmers. He said that he had asked the Chief Minister of Uttar Pradesh, Yogi Adityanath, to send a team to Gujarat and study the Pashu Arogya Melas. He added that a similar Mela had been organised recently in Varanasi, which the Prime Minister had an opportunity to visit.